[SatNews] ...to deliver C-, Ku-band and Ka-band multiplexers, switches and microwave components for multiple satellites which will be part of a global network of communication satellites. COM DEV International Ltd. (TSX:CDV), manufacturer of space hardware subsystems, today announced that it has received its largest commercial award ever. This major contract is in excess of $65 million to deliver C-, Ku-band and Ka-band multiplexers, switches and microwave components for multiple satellites which will be part of a global network of communication satellites. The initial funding release, in excess of $38 million, is to cover procurement activities for these satellites as well as engineering and manufacturing activities for the first satellite to be delivered. Work will be ongoing until 2018, and will be carried out at the Company's facilities in Cambridge, Ontario and El Segundo, California. "COM DEV is pleased to support our longstanding customer on this multi-satellite program," said Mike Williams, President of COM DEV International Products. "We are happy that this relationship has allowed us to provide a technically optimized and cost-effective solution that will enhance our leadership in the supply of passive microwave devices for the communication satellite market." 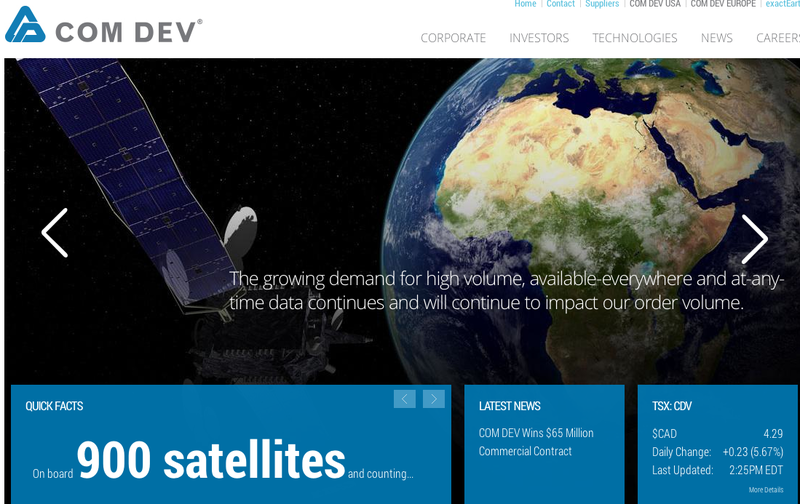 COM DEV International Ltd. is a global provider of space hardware and services. The company has a staff of 1,300, annual revenues of $208 million, and facilities in Canada, the United Kingdom and the United States. COM DEV designs manufactures, and integrates advanced products, subsystems and microsatellites that are sold to major satellite prime contractors, government agencies and satellite operators, for use in communications, space science, remote sensing and defense applications. The company has won contracts to supply its equipment on over 900 spacecraft.